Deep inside an unknown and gloomy jungle, there lived a tribe which created creepy and mysterious masks as part of a traditional ritual. Even though you might feel like some of them are continuously staring at you, they are here to line up on your slot grid to award you grand prizes. 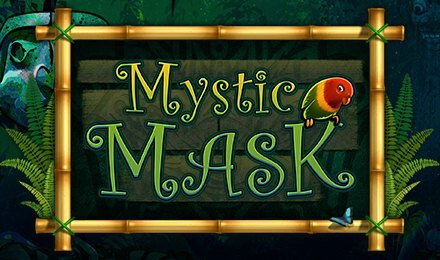 Mystic Mask slot by Random Logic, is a 5 reel and 40 payline slot game that allows you to benefit from a number of features like; stacked symbols, free spins, expanding wilds and bonus rounds. Symbols you will find landing on the reels are; multicoloured masks, 10, J, Q, K and A. The gameplay of Mystic Mask slots is simple, all you have to do is to land winning combinations from the right-hand side to the left-hand side of the slot grid for a win. Furthermore, the controls on the screen allow you to set your bets and use the Autoplay option. Coin Values: Set your bets from the lowest amount of £0.40 to the highest amount of £480.00. The wild symbol is represented by symbol “Wild” itself, and it replaces all symbols bar the bonus and scatter symbols. Scatter takes form of the “scatter” itself and triggers the free spins round of Mystic Mask slot. The bonus symbol takes form of “bonus” and this triggers the bonus round of the game. Lining up three, four or five scatter symbols anywhere on reel one, three or five will trigger the feature. You are then awarded ten free spins which can be triggered again. Once the spins are at play, wild symbols that land during the feature expand to fill up the whole reel. This increases your potential of winning. Landing three, four or five of the bonus symbols anywhere on reels two, three and four trigger the Mask Bonus Feature. Here, you get to play a two-stage picking game. In the first stage, pick one of the five continents on the display, then one of the five masks related to the continent. This reveals two multiplier values that’s applied to your total bet. On a win spin that is more than 10x your total bet, you will have the choice to gamble your wins for double or nothing.